"Historical periods are dominated by distinct sets of beliefs, widely imitated behavior, and prevailing practices which taken together, form a fairly consistent, easily distinguishable, and well defined Zeitgeist." "A new art for a new age. Such was the refrain that ran through the avant-garde, from the time in the nineteenth century when Baudelaire announced his search for a 'painter of modern life.' By 1900, the 'modern life' was being defined by the remorseless spread of the new technologies of energy, transport and communication, and by revolutionary notions of the human mind and of time and space. Cubism seemed to provide an art that embraced the new situation." "... are examples of of sets of ideas that dominated their historical period. The changes from one period to the next is usually rather gradual; other changes--more abrupt--are often referred to as revolutions. The most far-reaching of all these intellectual upheavals was the Darwinian Revolution." Darwinism, as these ideas about struggle, fitness, and progress where mistakenly popularized became influential in both a reactionary or social darwinian sense and progressive in the movement of Reform Darwinism. "The worldview formed by any thinking person in the Western world after 1859, when the Origin of Species was published, was by necessity quite different from the worldview formed prior to 1859." "It is almost impossible for a modern person to project back to the early half of the nineteenth century and reconstruct the thinking of this pre-Darwinian period, so great has been the impact of Darwinism on our views." Ernst Mayr, One Long Argument, p. 1. 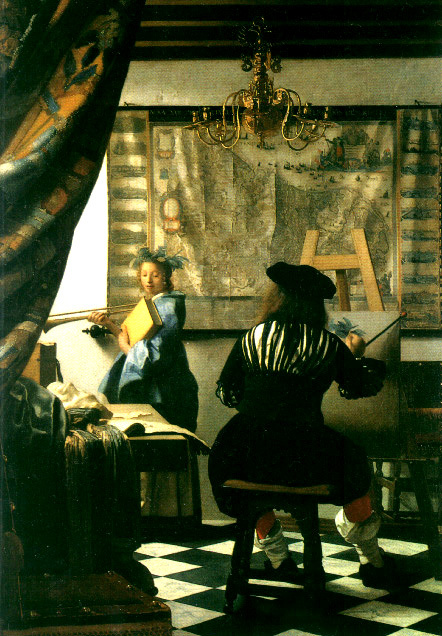 In the painting by Vermeer above the checkered floor patterned on a chessboard, or an everyday rendering of the Cartesian coordinate system, is the foundation on which the rest of the action and the symmetry, proportionality, luminosity and imagery takes place. Set against the background of the artist's studio in Delft, the woman models Clio, the muse of history, amidst the backdrop of a map of Holland, or the low countries as the Netherlands were often referred to in the 17th century. The painting captures a particular worldview at a time when the Zeitgeist of Europe was infused with mechanistic, commercial and imperial perspectives as the wealth of the world's plantations, slaves, crops and minerals literally flowed through the harbors of Delft, Amsterdam and Rotterdam on their journey up the Rhine River into the very heart of western Europe throbbing with growing populations whose youth marched incessantly to the martial beat of war drums every generation from 1500 until 1815. The Dutch Republic, itself a merchant oligarchy, was the product of a long, bloody revolution against Charles V of Spain and the Holy Roman Empire. As was the custom of the period, the artist captures the desire to portray classical Greek and Roman themes, here Clio the Greek muse of history. The movement from darkness of the past into the light of republican and middle class virtues can be interpreted as Vermeer paints a scene where we, the audience, are cast as "peeping" into the studio from a dark outer chamber. The artist's illumination of the scene bespeaks, for a knowledgeable viewer, the capacity of history and the northern European Renaissance (1500-1700) to shed the light of reason, temperance, compassion and courage into the dark heart of the European imagination. Or the light of the present illuminates how the past, as held by the muse in her arms as a book, speaks (trumpet) or resounds in the everyday artifacts that consume our lives and define the contours of our present visions. The German historians used the term Zeitgeist, to encompass and convey the "spirit of the times." In the above case that spirit is one of vigorous imperialism, fueled by mercantilism and hope of commercial gain, and sanctified by Protestantism. The prevailing Protestant belief that each person could discover God's light on their own by pursuing a careful study of scripture and harboring a humble respect for the sanctity of Christ's promised redemption. The artist is portrayed in the act of creation, brining to life on the canvas the very scene the painting of the muse, itself, depicts. We are forced as we look carefully at this portrait of an age of reason and ambition, to recognize that this image is weighty with the substance of a paradox. The muse of history is portrayed in the creative action of the painter to capture the very luminous moment in the past as if the work remained unfinished in the present. We stand in the dark antechamber of his studio representing the present as it were, watching the artist create the image of the actual finished portrait of the muse that we may admire as a complete work. Vermeer captures the tension in the commercial republican Zeitgeist of the "golden age of Holland" where a people and their culture had one foot planted in the imagined Greek republican past, and the other firmly planted on the the new map of the world where Dutch interests tenaciously clung to footholds in South Africa, Indonesia, Guiana and the West Indies, or the Hudson River Valley as fiercely as they lay dry the polders of the Zuider Zee (South Sea). This is the great body of water that stretched along Holland's northern coast, to the right on the map of the Netherlands portrayed in the background just above the top of the easel where the seated artist is painting. Vermeer captures for the viewer today the irreconcilable tensions and enduring hope inherent in the worldview of an earlier "self-congratulatory, wealthy and imperial age." Images ignite the capacity to excite the imagination as do experiences, odors, sounds or flavors. a process of determining meaning from the context of written words which produces a lasting impression of the authors point and infuses any reactions to her / his words with a textually based understanding of what was written, as opposed to what we might think was written. lessons in stone, oils and fabrics? Etymological origins and root words: EIDETIC <= eidetikos; a shape. an ideal person, place or thing. videre, Latin to see, behold, envision. an imaginary, yet sharply detailed, mental invention or conception. idol, idolatry, idea, ideal may all be related words. Images can evoke a set of ideas distinct in their internal coherence and particular from all other "distinct sets of ideas." Thus from the war of nature, from famine and death, the most exalted object which we are capable of conceiving, namely, the production of the higher animals, directly follows." There is a grandeur in this view of life, with its several powers, having been originally breathed into a few forms or into one; and that, whilst this planet has gone cycling on according to the fixed law of gravity, from so simple a beginning endless forms most beautiful and most wonderful have been, and are being, evolved." [On the Origin of Species, "A Facsimile of the First Edition"
In a tropical flood forest. This is the assembly of life that took a billion years to evolve. It has eaten the storms ....folded them into its genes... and created the world that created us. The Diversity of Life, p.158, ¶ 29 & p. 160, ¶ 38. The contemporary world's zeitgeist is dominated by materialism, immediacy and intense individualism that separates us from our immediate and distant ancestors. We are serious Epicureans and skeptics which leaves many non Christian and non-western peoples both intrigued and appalled by our lack of depth and inability to articulate a vision of the world that cares for other humans, despite the fact we are growing at a rate inconceivable to our grandparents and have money beyond the dreams of our parents. Contented, clean and comfortable most western people ignore the plight of developing nations where people have to pay for education, may not have clean water and who face extremely low wages for the work they perform.